LEADING a trade mission to India is never less than thrilling, stimulating and invigorating. It’s a lot of other things too – including full-on, challenging and slightly stressful! But when you lead a delegation – as I did in September – showcasing with some of the most exciting and innovative healthcare providers anywhere in the world, it makes every second worthwhile. I was one of the leaders of a week-long mission which took us to three of India’s biggest and most important centres of excellence in healthcare, Bangalore, Kochi and Delhi. Along with former deputy high commissioner in Chennai, Mike Nithavrianakis, it was my pleasure to accompany 18 delegates from 11 UK organisations on visits to meet health sector leaders in Bangalore, Kochi and New Delhi. It was really encouraging to see the remarkable scope and vision of the organisations represented by the UK delegates. They are at the cutting edge of what the world has to offer in the healthcare sector. Our mission was focused in four specific areas – support for infrastructure in the healthcare sector, clinical service development, digital health systems, and education and training. I can’t mention all of the delegates, but I thought I’d just highlight a handful of the innovative businesses and organisations represented on the trip. It was great to have several representatives from the UK’s NHS with us. Obviously the NHS is revered in India for a number of traditional and historical reasons, and there is a certain mutual respect and understanding between healthcare professionals in the two countries. 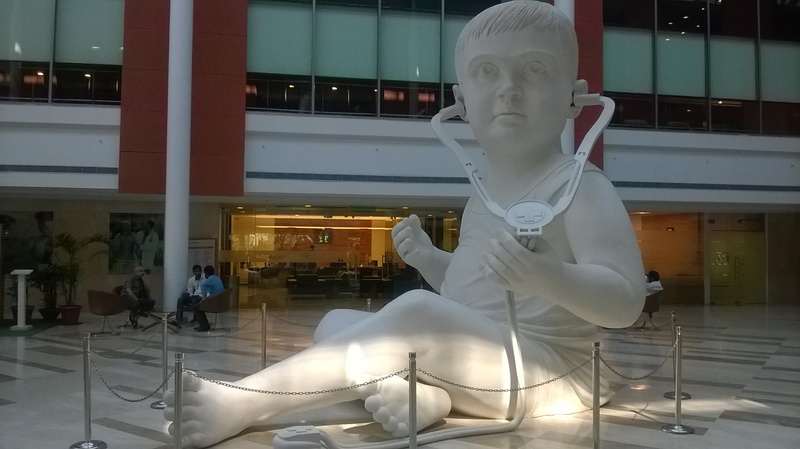 The Surrey and Borders Partnership NHS Foundation Trust was one NHS organisation which formed encouraging links with hospitals and healthcare providers in India. Three delegates from the trust met health practitioners in India to discuss the issues of mental health service provision. The trust is one of the leading providers of specialist mental health, drug and alcohol and learning disability services for people of all ages in southern England. The Indian representatives we met were especially interested to hear about how services are provided for children with mental health problems and the new developments around care and treatment – services for children with, for instance, behavioural and neurodevelopmental conditions like ADHD or autism. It’s an issue of growing concern in India, which is only just beginning to get to grips with this type of condition, and with the need to fund extra training, research and education. On a totally different side of things, Professor Sunil Bhandari, a consultant nephrologist with the Hull and East Yorkshire Hospitals Trust and representing the Yorkshire and Humber Academic Health Science Network, was there to meet people with a view to setting up a network for research and development opportunities. India is remarkably forward-thinking and innovative when it comes to healthcare, and has some truly world-class hospitals which want to partner with the UK. Professor Bhandari discussed potential collaborations in a range of areas, including clinical research and healthcare delivery, but also high end services like complex liver transplants. A third NHS trust delegation came from the Liverpool Women’s Hospital and the connected Hewitt Fertility Centre, one of Britain’s largest IVF units. There was great interest from the India representatives at the five hospitals we visited in fertility treatment around new developments and training in the sector. Innovative technology is an area in which the UK is a recognised world leader – and it’s an area of interest shared by the Indian representatives that we met. Innovation was a strength of all the UK delegates, including medical imaging company TexRAD, which provides a remarkable new system to look at the texture of medical images and provide quantative data. It offers another way for a medic to assess cancerous tumours and the effect of treatment rather than simply relying on what their eye can see. Then there was CyberLiver, a specialist digital healthcare company, which has – among other things – developed a system to help people monitor their alcohol intake by attaching a type of breath test to their smart phone. Again, Indian healthcare professionals are looking seriously at the increasing issue of excess alcohol consumption among their population. I should also mention that there was enormous interest, for obvious reasons I suppose, in CK Group Services which works to improve the general cleanliness and hygiene in hospitals. The improvements come not through a specific cleaning product, but through the installation of easily cleanable materials, improved training for staff, and by using the best cleaning tools and monitoring systems. I have to say, it was an enormously fruitful and worthwhile trip. There are enormous challenges ahead for India. Its government knows it needs to spend more on healthcare, and take advantage of its robust economic growth over the past two decades to provide a more inclusive healthcare system. But it’s a country that is willing to innovate and transform its services, and also create meaningful collaborations with partners from other countries. Through this type of trade mission, Healthcare UK is doing what it can to put UK businesses squarely in the spotlight in India. From our feedback from the delegates on the trip, there were certainly enough meaningful discussions and genuine leads to encourage UK providers to pursue follow-up propositions. We will be helping our UK businesses target these leads over the next few weeks. In the meantime we are busy organising a further trip, probably in February. Feel free to get in contact if you are interested in joining us.